You may be searching for information about preservation and viewing of cine film, or wish to have old family cine films transfered into a viewable digital format like DVD. I have assembled this site to be informative about the necessity for film preservation, and also about the transfer and digital video copying of cine films. I am empassioned by film, especially old British films which are now sadly neglected and unseen. I believe that film is a window to our past that resonates still. I believe the photographic medium, over the last one hundred and fifty years, has shaped the present as we perceive it, and live it, day to day. The first films I projected were 'Cathy Come Home' and the Polish animated cartoon, 'Pozor' (Attention) when pressed into operating the empty projection box by an audience of 800 striking students. From then on I have projected many hundreds of films. It was antique watch and clock repairing to the trade for no money over years until eyesight changed and I stuck with clocks. Supplemented my income with photography and articles about the clocks I restored but did not own. I always used Weston lightmeters since an Art student and independent film maker in the 1970's. 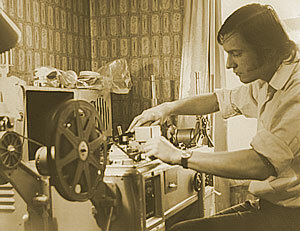 I used to repair film and editing equipment too. Ran the local film society so I got to handle classic film prints and more appreciate the art of cinematography which I was able to complete a local documentary and Arts Council film with my old tutor at Art School, Bruce Killeen. This is how I dropped my Euro-master onto concrete when transporting an Arriflex on my bicycle rack. Easy to repair as I was doing watch work at the time and of course the cell was good as the meter was forty-six years younger than they all are today. I was selling antique clocks on the internet and in those early days when digital cameras were beyond my means I was photographing with medium format Ektachrome transparencies that I scanned. This way my photography was outstanding at the time. I used to include an animated gif of each clock pendulum swinging on the web pages that was not replicated by anyone over the years I was selling. I first sold a Weston Euromaster in 2001 and got £100 which was so encouraging I invested in new cells from Megatron of Tottenham and restored a number of meters in anticipation. I sold only six meters over the next nine years. However by 2010, the frequency had increased and I soon tried to order more cells. Of course, Megatron had only just ceased trading and making the new cells. The demand for my restored Weston photographic light meters has picked up very gradually. Lately, I have had no time for clock repairs because of demand for my restored 'new' Weston meters and meter repairs. Also this website has hundreds of visits each day. It needs to, because I cannot think of a time when I have had to work so hard just to live, at an age when most people are retired. I must be paying back for my indolent past! www.Ian-Partridge.Com ~ Web page content photography and design ~ Copyright ©2009 ~ 2019 Ian Partridge.